Camiguin Island, Philippines -- 6 Amazing Reasons Why You Should Go! #1 - Lanzones Festival: Celebrate with the locals, as they celebrate week-long Lanzones Festival, which is an extremely colorful and fun occasion,that happens yearly in October. Lanzones is a yummy round fruit, that tastes sweet and sour -- it's so aplenty in Camiguin, so go ahead and devour! 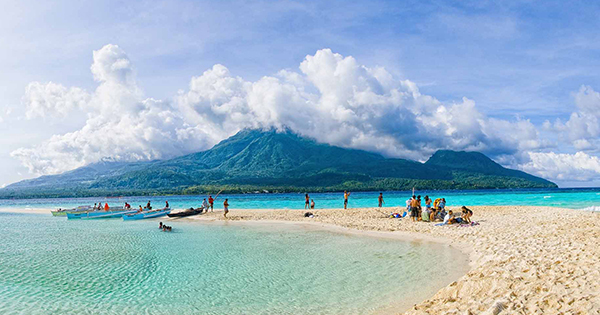 #2 - Great Volcanoes: Towering and picturesque Mount Hibok-hibok, Mount Vulcan, Mount Timpoong, Mount Mambajao, Mount Butay, and Mount Guisiliban are just some of the captivating sites to gaze at in Camiguin Island. Promise, these beautiful mountains are never camera - shy! #3 - Charming Islands: Just 1.4 kilometers away from the northern part of Mambajao's shore, you can explore White Island -- an unspoiled white sandbar shaped like a horseshoe, with very white sand, surrounded by the sea, that's deep blue. On the other hand, you also shouldn't miss the bliss at Mantigue Island, situated approximately 3.5 kilometers off the coast of Camiguin. This stunning island is adorned with a white sand beach on top of a world-class snorkeling and diving point. #4 - Relaxing Springs: Let your weary feet bring you to soothing Ardent Hot Spring, Santo Nino Cold Springs, Bura Natural Soda Water Swimming Pool, and Tangub Hot Spring -- where even a cool school of fish is waiting to go swimming with you! How is that as a free massage? #5 - Sunken but not forgotten Cemetery: From about 1871 up until 1875, Mount Vulcan erupted ferociously and long enough to bury so many areas in Bonbon town, specifically sinking the graves of the Camiguin people's ancestors into the sea. Hence, a huge cross was built on top of this spot, which has become an enchanting tourist destination where both the locals and visitors reminisce about that fateful historical event. #6 - Cascading Waterfalls: Pursue all the more, being one with nature, through an adventure over at Katibawasan Falls -- located at Santo Nino Cold Springs, Camiguin Island. Its water thunders down into a cool, crystal clear pool, where you can take a dip and be hip! Last but definitely not the least, check out pretty Tuasan Falls, too. This waterfall occupies a site which is 6 kilometers northeast of Catarman. Below its strong, cascading water, is a clear, as well as deep pool -- thus, take a plunge and get a bunch of fun under the Camiguin Island sun as soon as you can!